MANILA -- Andi Eigenmann is expecting another baby. "Haven't been as active on social media for many (great) reasons. Been adjusting slowly but surely to my 'new life,'" she said. "The journey has been so exciting yet scary at the same time, but we have been so happy and at peace nevertheless. Still wouldn't have my life any other way." 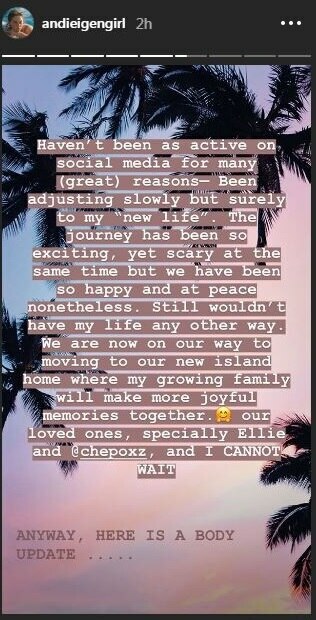 "We are now on our way to moving to our new island home where my growing family will make more joyful memories together... and I cannot wait," added Eigenmann, who is in a relationship with surfing champion Philmar Alipayo. Ellie is the actress' daughter with her former boyfriend, Jake Ejercito.